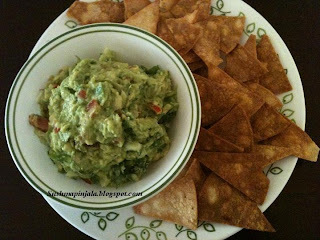 We need only ripe avocado's for this recipe. Cut avocado to have and remove the seed, remove skin and mash the avocado with spoon. Add chopped onion, tomato, cilantro, lime juice, chili flakes and salt . This can be stored in air tight container for up to 3 days. We love Mexican tacos, tortilla chips and salsa. The recipes are made with simple ingredients and simple method. For the day 2, I made chicken soft taco's. Taco is a traditional Mexican dish composed of a corn or wheat tortilla folded or rolled around a filling. A taco can be made with a variety of fillings, including chicken , sea food, vegetables and cheese allowing for great versatility and variety. 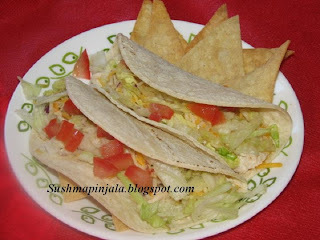 Today I make chicken soft taco, which is simple and delicious. Chop onion and tomato to small pieces and keep aside. Have used the left over chicken which I bought from store. You can even bake or grill chicken at home by simply adding some salt, pepper powder, oil and any seasoning. Grill or bake it till done. Let it cool to make small pieces. Also used store bought soft tacos. 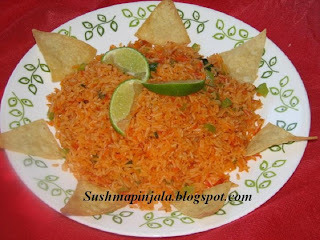 Spanish rice or Mexican Rice is a side dish made from white Rice, tomatoes, garlic and onion, and other ingredients. It is traditionally made by sautening the rice in a skillet until it is golden brown. Water or chicken broth are then added along with chopped tomatoes or tomato sauce. Although called "Spanish rice", this dish is unknown in Spain. The term "Spanish rice" is not used by Mexicans or Mexican food enthusiasts, and its use probably stems from the fact that the Spanish language is spoken in Mexico. It is a popular dish in the American Southwest, which refers to the dish as "Mexican rice". The version of the dish cooked throughout Northern Mexico tends to be a more homogeneous character, often with just enough tomato and Chili pepper to give the distinctive red-orange color and a smoky, garlic and onion-laden flavor. It is usually served as a side dish alongside other Mexican cuisine. For the last day of this week I am here with a new dishMomo's or dumplings. Momo were introduced from nepal, as Momo is a loanword from the newari mó:mo, a type of steamed bun. 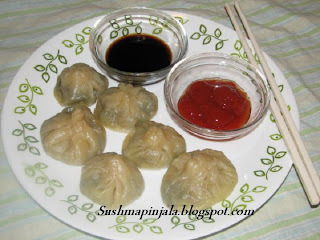 Momo have become a traditional delicacy in Tibet, Nepal, Bhutan, Sikkim, Darjeeling district and Ladakh. They are one of the most popular fast foods in many regions of the Indian Subcontinent people of Tibetan, Nepali or other Himalayan origins, and in places with a significant Tibetan and Nepalesediaspora, such as Assam, Delhi, Mizoram, Manipur, Nagaland, Meghalaya, Himachal Pradesh, Shillong, Arunachal Pradesh, Uttarakhand, and West Bengal. This is the one of the healthy and simple breakfast I would say. When I came to USA, couple of years ago, my dear hubby took me to IHop( International House Of Pancakes) for breakfast.Which is famous for its pancakes. Hubby ordered Pancakes and I ordered veggie omelet. 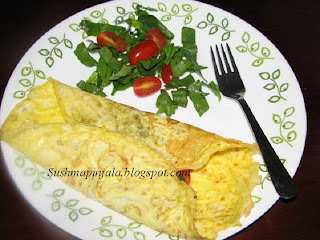 It was plain omelet with spinach, tomato, olives, mushrooms and lots of cheese as its filling. It was so yummy and filling. I am one of those who do not like cheese. So I made this healthy omelet with out cheese for my self and with cheese for rest of the family. Now when Valli came up with a theme "Members Choice" it had couple of items like mo mos, cakes, puffs, Non- Indian breakfast, etc. I had couple of things going on in my mind like,pancakes, waffles, muffins etc. Then I thought why not make the omelet which I had couple of years ago in Ihop. So here I am with this yummy, healthy and simple breakfast for the day. Today we are starting with 2nd week if BM 31, I choose " Member's Choice" as my theme. Valli asked us to name few recipes which everyone is interested to cook. All the BM members have come up with few recipes. In which Ariselu is the of the recipe. I have tried to make these couple of times but never came out perfect. But this time I was success. Taste and texture everything was perfect. 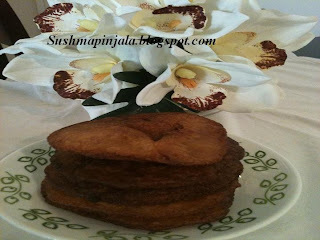 Ariselu is a telugu work which means a sweet made with rice and jaggery. This is also known as Adhirasam in Tamilnadu and Kajaya in Kannada. This is a traditional dish prepared during festivals. Rice has to soak in water for at least 2 days. Make sure to change the water every 8 hrs. Drain the water and dry the soaked rice on a dry cloth to dry. Now make a fine powder with the rice.